The term "functional" means that the problem is not structural and the brain is not diseased or damaged -- it is simply not developing as it should. This developmental lag may cause one brain hemisphere to be out of sync with itself or with the hemisphere on the other side. It is unfortunate, but typically, when a child is evaluated due to a learning, behavioral or social disorder, they undergo minimal neurological examination and are usually given a label as having a disorder such as ADHD, a learning disability or autism. The majority of these concerns such as ADHD, learning disabilities, reading disorders, OCD, Autism, Tourette's Syndrome, Asperger's Syndrome and sensory processing disorders are caused by Functional Disconnection Syndrome. These conditions can be caused by either a left brain deficit or a right brain deficit. 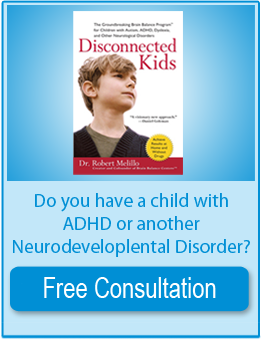 For example children or teenagers struggling with ADHD and poor focus typically have a Functional Disconnection Syndrome affecting their right brain. The majority of the Autism Spectrum disorders such as ADHD, Asperger's Syndrome, PDD-NOS and even OCD are right brain deficit problems. 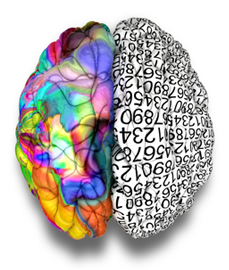 ADHD is a less severely involved right brain disorder as compared to autism. In ADHD, many times just one region such as the right dorsolateral pre frontal cortex is involved, where in autism, many regions of the right brain may be involved. In order to fully understand these neurodevelopmental disorders, Its essential to look at them in terms of "hemispheres," or sides, of the brain. Non-verbal communication is the foundation of verbal communication. One must first have non-verbal communication such as understanding one's feelings,facial expressions and body language before verbal communication develops. Essentially the non-verbal precedes the verbal. One method to encourage appropriate speaking in these children is to work on building the foundation - non-verbal communication which is the right brain. Why are there so many "sensory" problems with these children? Sensory issues most often are not a problem with the particular "sense." We look at each specific brain region that could be affected. In addition, we also examine the child or teenager's specific functional capabilities and the neurochemical components as well. This is different from just using parental questionnaires and generalized batteries of tests, and quick observation to make a diagnosis or assign a label. That approach does not look at various areas from a functional neurological model. We are also very concerned about knowing the individual child's brain metabolic capacity or endurance. We don't want to over stimulate or exceed the child's metabolic capacity with our therapies. This approach is very individualized . We determine all of this in our examination. Proper sensory and motor development is essential for proper growth and development of your child's brain. Your child's interaction and experience with the world provides the sensory and motor stimulation required to build and develop their brain. 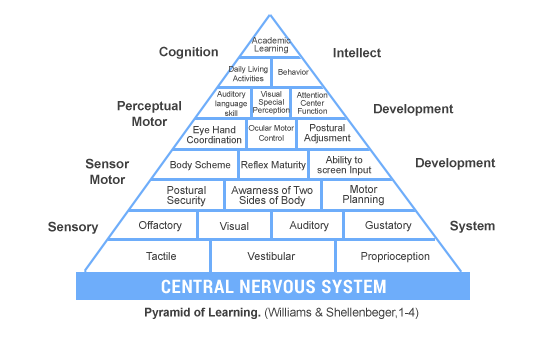 The brain develops from the bottom up -- from the brain stem up to the cognitive cortical centers of the brain. When a baby is born, their brain stem is the primary area of their brain that is developed and functioning. The higher level cortex has not yet developed. The brain stem controls all internal organ functions and causes movements that are primitive and purely on reflex such as hand grasping, sucking and rooting.